The turmoil of having to say goodbye to someone or something inevitably flashes me back into the body of my 8 year old self, a grade school aged girl with a best friend named Melanie. Melanie had mid-length mousy brown hair that stuck out as far out sideways as gravity would allow. She was just pudgy enough to be cute, short enough to make me feel tall and nice enough to be friends with a strange kid such as myself. As a child I only kept one or a small number of friends at a time. I never quite knew the right things to say to the other kids. I did not realize, understand or care that acting in certain ways made you likeable and others made you weird. I just was the way I was and I did not think much about it. That is, until Melanie had to move away to New Zealand. I do not recollect if I was sad exactly. I just knew that a girl who I spent a lot of my time with was not going to be around anymore. I am not sure whose idea it was for us to be pen pals. Maybe my mom thought it would keep me from being upset. But one day, Melanie was gone, and instead of her, I had her letters. Mostly written in pencil, sometimes there were drawings. Each time one arrived I would write one back and over time I am sure they became more sophisticated. But of course, inevitably, we lost interest. We were kids, with short attention spans and lives with tangible activities to draw our attention and real people and places to keep us otherwise occupied. I do not remember being bothered that we grew apart, maybe I noted upon it once and awhile but as strange as I was, I made other strange-tolerant friends. Eventually, I must have stopped thinking about Melanie and how she left me for a country on the other side of the planet Earth. That changed when my newer best friend, Jackie, switched schools in Grade 5. By this time, ten year old me realized that having a friend move away meant losing an ally (an important thing for every grade school child to possess). Once I put it together that I had lost two best friends in a row was about the time that I realized that life for a kid is not always easy. And now, at 29, with each goodbye (I hate every single one), I think of Melanie, New Zealand and hand written notes. On Friday, I said goodbye to my old supervisor and lab members. We had a dinner, exchanged gifts and officially bid adieu. I was not sad to say goodbye but celebrating my send-off makes all of the changes that have happened over the past 6 months much more real. I have graduated, I have started a new job; I went from knowing everything to knowing so little. And here I am again, starting anew, building new experiences, knowledge and relationships until the next wave of change approaches and I am forced to start all over again. At least when we grow older, saying goodbye usually comes with some form of a celebration. Maybe after a few sad and lackluster childhood partings we grow up and realize that saying goodbye does not have to be a solely depressing event. By having one last celebratory rendezvous, sending someone off can be filled with laughter, friendship and of course, almost always, delicious food. Another goodbye that is fast approaching (some may say it has passed but I am holding on) is the farewell to summer. The cool wind that urged me to don both a sweater and a jacket before heading home from my lunch break is a sure sign that summer is ending. Which is a shame because I feel that the summer produce in Vancouver has just started to make an appearance. I made today's salad as a toast to the wonderful perfect summer tomatoes, sweet corn and tender yellow zucchini that will surely be gone by the month's end. Seasonal, ripe and fresh tomatoes and corn make this salad sing. Tomatoes taste best if you do not put them in the fridge. Buy them ripe, keep them on the counter and use them as soon as possible. Also, small, tender, yellow zucchini is far superior to regular green zucchini in this dish. Lastly, Meyer lemon juice is only necessary for those who like a little extra flavour on their salads; if you use great quality ingredients it really is not needed. 2. Toss yellow zucchini in 1 tbsp olive oil, garlic and sea salt in a bowl. Reserve extra juices/garlic in the bowl and spread the zucchini on a parchment paper covered baking sheet. 3. Cook zucchini in oven for 15 minutes, turning once. 4. In the same bowl, whisk in 1 tbsp extra virgin olive oil and meyer lemon juice. 5. Prepare salads by arranging tomato pieces, corn, zucchini and basil into bowls. 6. Drizzle a tsp of dressing over the salads and enjoy immediately. 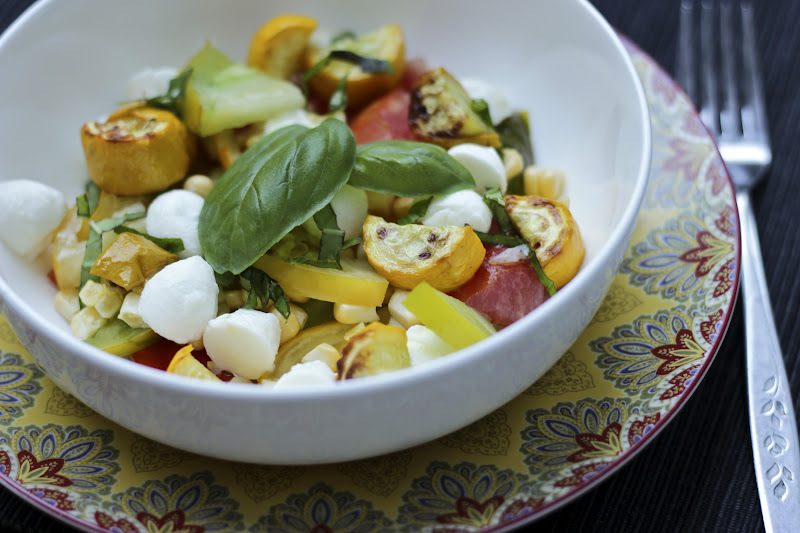 This salad looks perfect for the end of summer, and all the zucchini still bursting out of the yard. :) Bocconcini are always a win in my book!